Hey, I’m killing two birds with one stone today, and I sincerely hope that's not offensive--forgive my ignorance if it is. 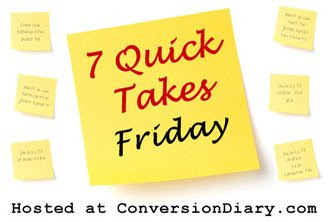 I’m participating in the usual Seven Quick Takes, sponsored by Jennifer at Conversion Diary, and I’m also participating in Robin’s Blog Hop. Try real hard not to be confused here. Jennifer has us list seven random things about our week, and Robin wants us to introduce ourselves to new bloggy friends. So, in honor of both of these wonderful women who have figured out Mr. Linky and actually use him, I’m giving you seven snippets of information about me. Welcome to my Life on the Wild Side! 1. I’ve been blogging for a little over a year now, and I’m not tired of it yet. In fact, I love it! And the reasons I started the blog still stand today. I still, however, have very few followers, so if you’d like to follow me it would make me over-the-moon happy. 2. My tagline, “Because every day is an adventure” is so true! My kids get sick of hearing it, but you can see for yourself here and here and here. 3. I’m married to my college sweetheart, B. I am the luckiest woman in the world to have found a friend and partner like him. 4. I have three daughters who keep me on my toes. My oldest is looking for a college right now and reminds me on a regular basis that one year from now she’ll be gone. Believe me, I am more than aware of this. 5. I have some wonderful friends who also keep me on my toes. I am blessed beyond belief to have a small group that cares about me and Amy who feeds me. 6. Cooking relaxes me and makes me happy. So does Food Network. You can check out a couple of my favorite recipe posts here and here. 7. I enjoy giving things away, so if you’ve read to the bottom of this post and leave me a comment telling me one thing you and I have in common, I’ll enter you in my $25 Starbucks gift card giveaway. Just make sure I have your email address so I can get in touch with you if you win. Thanks for stopping by and please . . . come again! Popping over from the Blog Hop to say hello! I was one of three girls growing up myself! 3. I married my college sweetheart. I can't WAIT to meet you next weekend!!! You married your college sweetheart but I married my high school sweetheart! My three children absolutely keep me on my toes too :) Although the idea of one of them nearing college age scares the bajingas out of me, LOL. That would make me (*counts on fingers*)...never mind! Looking forward to moseying on through your archives over the next few days. My approach today? Slash and burn my way through the Mr Linky, randomly 'read later'-ing blogs. Then delving deeper as the week draws on. My oldest? He's leaving in a month for college!!! I'm going to handle it with dignity.....I MEAN IT!!!! boohoo boohoo! you and I have #3 in common... so nice to meet you, visiting from bloghop'09! Visiting from the Blog Hop to say Hello! I married my high school sweetheart, does that count? ;-) You have a beautiful blog. popping on in...a blog hopping I go! I too think every day is an adventure and oh boy does our busy lil bee of a daughter keep this mama bear on her toes. She's a 21 month old ball of energy! Hi there! Ok, so something we have in common - cooking makes me happy too. :) I peeked at the recipes you linked to, and oh goodness, that pork roast looks delicious. I also love to read, and so I am making some mental notes from your reading list on your sidebar. I've been waiting for Peace like a River to be in stock at my library, because I hear that is a must read. We also live life as an adventure #2 here in Bulgaria - and giving things away! I'm enjoying your blog, very fun! We live in the same town, I love to read, I love to travel. I love Wild Pasta as I call it. Those are just a few. I married my high school sweetheart. Does that count? We started dating when I was 14, and he was 16. Howdy!! Coming over from the Blog Hop!! I'm one of three girls. My daughter -- age 3 -- prays for a "sissy" everyday. She was my miracle child, and I'm not saying that I don't believe God can't do another miracle, but I am praying about adoption to make my li'l one's prayers be answered. OH, I LOVE to cook, too! Cooking makes me happy, too. Well, I only have 1 child but he definitely keeps me on my toes! Is that close enough? #3, without a doubt - I also married my college sweetheart (and refer to him by the first initial of his name, too!). I love a multi tasker!! Great work knocking off 2 items at one time. Excellent. I am just stopping by from the blog hop. I did not see a follow to click on? I could click follow on the top. just stopping by via BlogHop! so happy to have met you :) - i am also married to my college sweetheart! feel free to "hop" my direction any time! Hello there, I am visiting from the BH. I think every day is an adventure as well and I see you have enough on your plate that life is not boring! Stopping by on the Blog Hop. Isn't this fun? I enjoy cooking, too, especially when I can play music too loud while I cook. And the Food Network is my favorite channel! I too enjoy giving things away! Stopping by for BlogHop 09 and celebrating my birthday. I am married to the guy I date in college too. And in high school. We met when we were 14. BTW... Niki from NJ here. Nice to "meet you"! I enjoyed checking out your blog. I never thought about it, but you and I have at least one thing in common (with Jodi) - DNA. Also, the fact that I married my college sweetheart. Our common factor is that you and I have blogged for about a year. I did it mostly for contesting, now I've expanded to include reviews & giveaway! I grabbed your link from the BlogHop ‘09! Nice to meet ya! I hope you get a chance to stop by over at my blog, too. I have a few great giveaways here http://www.shortme.info/187/! I love the Food Network too! Much to the dismay of my 2 boys. They're 8 and 2, so cartoons are their priority. I can only take so much Spongebob and Dora in one day. Nice to meet you! I have stopped over from the Blog Hop.. I am visiting all of the blogs that end in 6 first. We both have in common our love for cooking for our families. I also love the Food Network. It was nice to meet you!! Well I must say cookies relax me too. I love the Food Network. Paula Deen is my fav!! My 3 kids keep me on my toes. Never a dull moment around here. Stopping by from the blog hop to say hello. PS I will follow ya! Have a great weekend. I have a small group that I love dearly also and I've been blogging a little over a year too! I am a Food Network-aholic too. Can't get enough of Barefoot Contessa, Giada & Tyler Florence. I married my after highschool/before college sweetheart. Great Site, Stopping by from BlogHop 09. Looking forward to getting to know you. Come on by and visit!!!! Glad I Hopped on over. One thing in common...my dottie keeps me on my toes too!! Thanks for the giveaway too! My blog hopping this weekend was definitely fueled by caffeine! I'm so with you on cooking being relaxing. Baking is my therapy! :) Nice to meet you! 44 comments - woo hoo! I don't know when the deadline is for the Starbucks card but I would love my name in that hat!! Yumm. Hopping by...love learning the 7 things about you...cooking stresses me out :-) but I love reading new recipes. It is great to meet you. I'm probably a little late for the give-away...but wanted to leave a note to say hello anyway. I found you on the blog hop. We are just starting kindergarten here...college sounds so far away but I'm sure it will be here before we know it. i am running a little behind on the blog hopping, but glad to meet you. If you have any pointers for a new mom (like how to prevent my son from throwing objects that are NOT balls) that would be great!